I know it is a bit early, but here is this weeks podcast. I discuss the topic of the effect of Peak Oil upon our food security. Finally, I am feeling a bit better. The abdominal pain is not so bad, but is still there. At least I don’t feel as tired as I did a few days ago. Today I had a CT Scan of the affected area, and visit my Gastroenterologist again tomorrow morning to see what treatment, if any, I need to have. Kim still thinks that I will end up in hospital on an IV for the entire Easter break! I hope not. Also, I have spent the evening producing the next episode of the podcast. It will be published tomorrow night. I have even managed to get it listed in the iTunes Store, so for those inclined, you can search for me next time you open iTunes! That’s all for tonight, worn out by the days events, and looking forward to finding out what can be done about this pain. 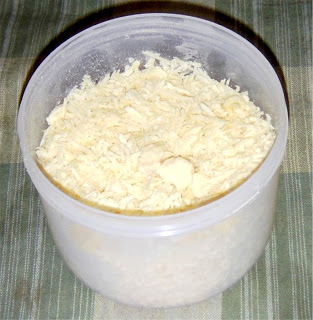 Today I made Parmesan for the third time, even though I felt washed out, and went to check my blog for the recipe and noticed that it wasn’t posted. Parmesan is really called Parmigiano Reggiano, named after the two regions in Italy where it is made. It is one of the worlds most famous grating cheeses. Normal sized wheels of Parmigiano Reggiano weigh about 46 kg each, but this recipe is modified to make 1 kg of this delicious cheese. It certainly beats the crappy, smelly, powered cheese you can buy in those green containers! Everyone in my family gives it a massive two thumbs up, and we eat it shaved or grated on many types of pasta dishes. So, in an attempt to aleviate that omission, here is how I made it. 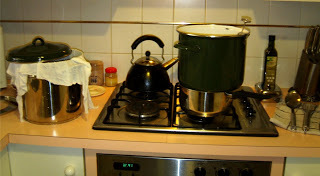 As usual I set up all the utensils and ingredients before I begin, then I sterilise everything in water in the 8 litre pot for 15 minutes. People are often surprised to discover that it is made with low fat milk (no more than 2.5% fat), because it has such an intense flavour. 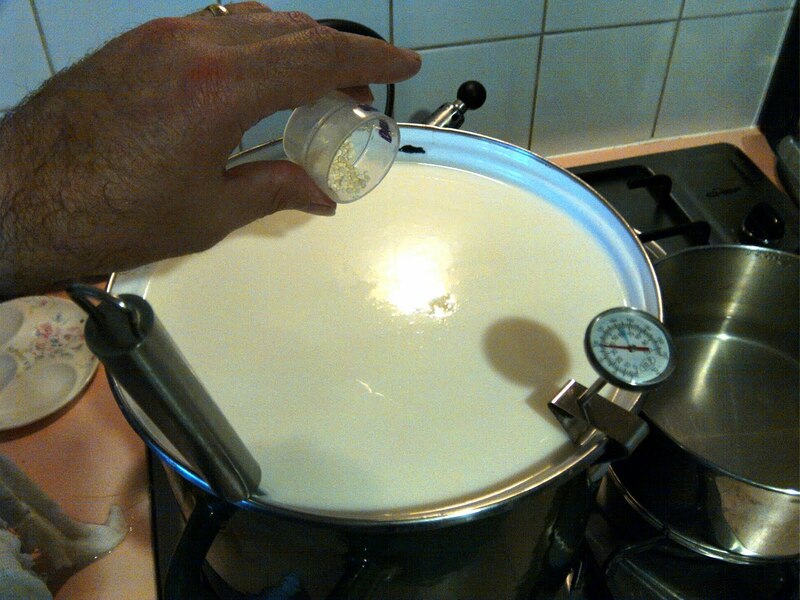 Add the milk and alternate a litre of each type to so that it mixes well, and then bring the temperature up to 35C. Once at temperature, add the Thermophilic culture and mix well. Cover and allow to sit for 15 minutes. 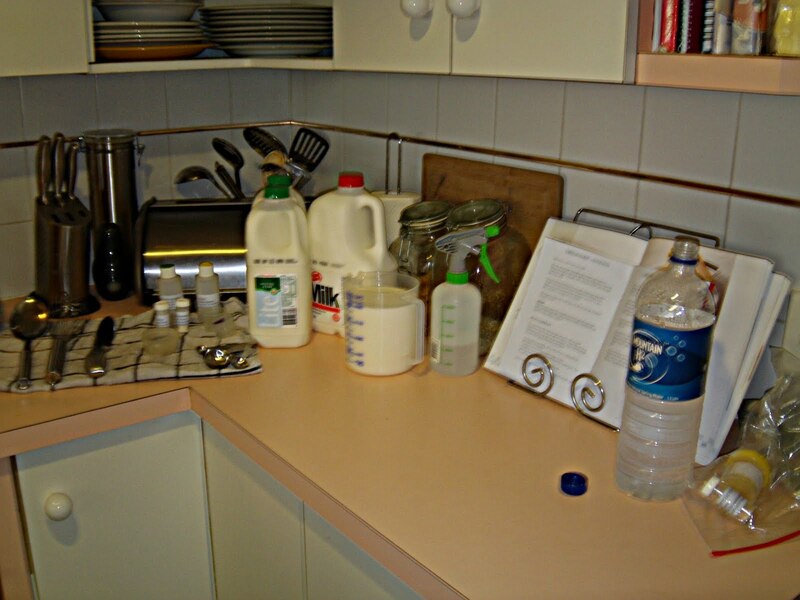 Add the Calcium Chloride and mix well. 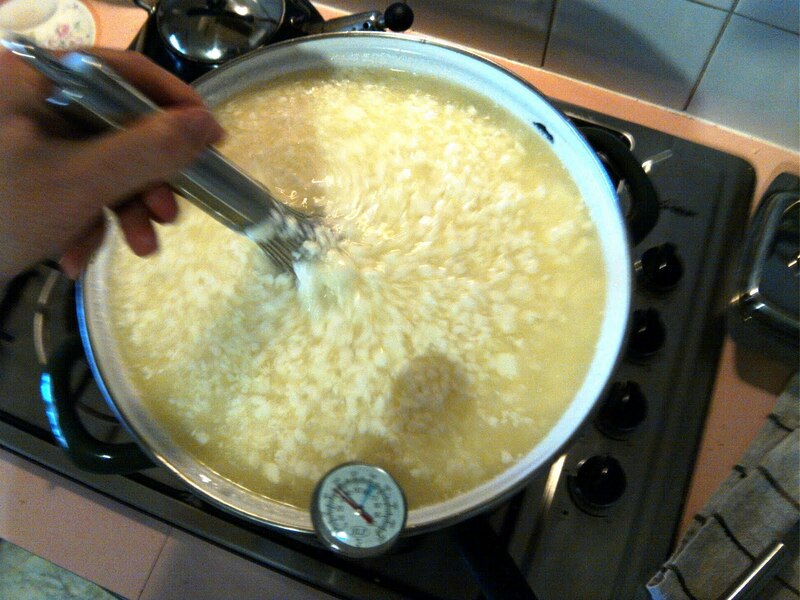 Then add the Lipase mixture and stir for a minute. Keeping the mixture at 35C, add the Rennet mix and stir for at least 1 minute. Remove from heat. Cover and allow to set for 45 minutes. Increase the temperature to 42C over half an hour and hold this temperature for 15 minutes continuously stirring with the whisk to prevent matting. You will notice that the curd will start to shrink into smaller grain sized pieces. Drain the curds and whey into a cheese cloth lined colander. Be careful as the whey is quite hot. Gather up the cheese cloth and form a ball of curd big enough to fit into your 900gm mold. Cover one of the corners of the curd with the cheese cloth and top with the follower then press at 2.5kg for 15 minutes. Remove the cheese from the press, and slowly unwrap the cloth. 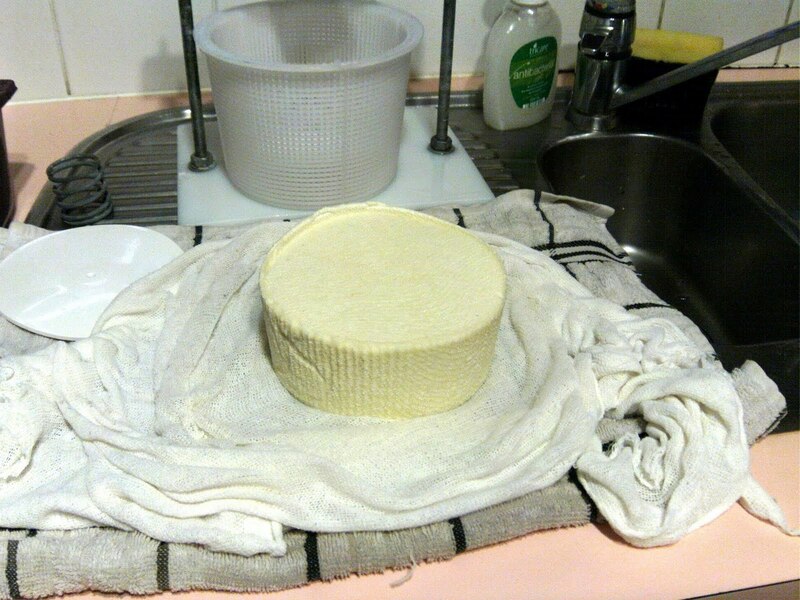 Turn the cheese over, rewrap it in the cloth, and press at 5kg for 30 minutes. Repeat this procedure, press at 7.5 kg for 2 hours. Repeat again, pressing at 10kg for 12 hours. Remove the cheese from the mould and unwrap. Immerse the cheese in the brine solution. I use a 2 litre icecream container, add the cheese first then pour over the brine. 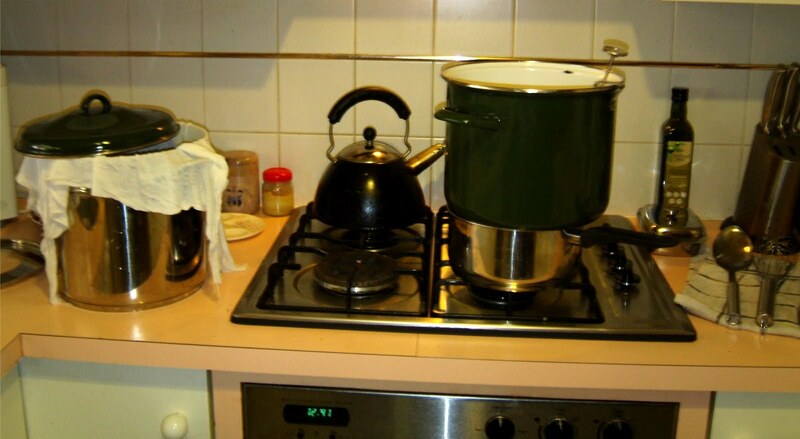 The brine should be at room temperature and not hot or the cheese will begin to break up and absorb too much salt. 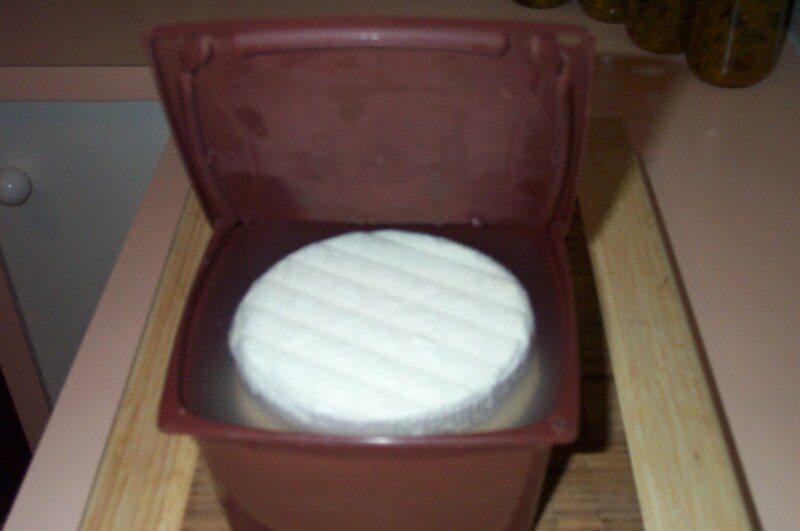 Leave it at room temperature (21C) for 24 hours, and flip the cheese occasionally. Take the cheese out of the brine solution and pat it dry with paper towel. Here is your chance to smooth the cheese with your hands if there are any rough bits. Then place on a sushi mat and put it into the cheese cave at 13C/80% humidity for 10 months. Turn the cheese daily for the first week, then weekly after that. 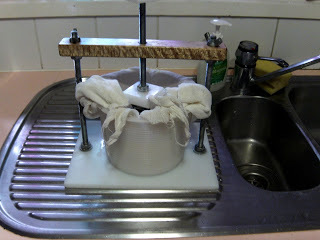 Remove any mould that forms on the exterior with some left over brine and a bit of cheese cloth. This also helps to harden the cheese as it ages. I usually wax this cheese at about the three month mark, because otherwise, even if rubbed with olive oil the wheel is just too small to hold the required amount of moisture and it will dry out. The first wheel of Parmesan made in May last year turned out very well and has that sharp flavour that Grana cheeses are well known for. Here is some I grated with a fine grater and keep stored in the freezer. We use a teaspoon per serve of pasta, as it is so flavoursome. I am leaving the second wheel for a full year, due to be cracked open on my birthday in May. I am looking forward to a few slices of shaved Parmesan on my birthday dinner! The trademark texture and flavour of this cheese is obtained though the lengthy maturation process which results in a cheese with a hard, gritty texture. I guarantee that this cheese is well worth the wait.